Another Moroccan beauty! The GAYLA offers fringe anchored by leather petals and a stunning hand-cut buckle that is centered by a cabochon of mosaic turquoise. 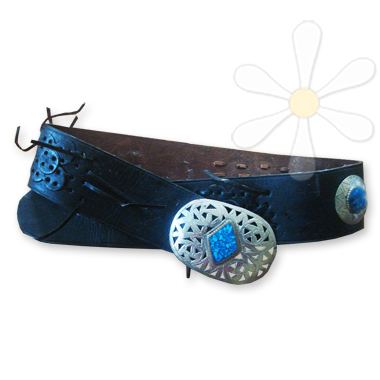 Between the leather decorations are two more turquoise cabochons, adding interest from every angle! We think this extraordinary piece is the icing on your Moroccan fashion cake!